Today I am dreaming of sleeveless tops and capri pants. It's hot and I have on long pants and long sleeves. When I went shopping this morning, I donned a headscarf and long coat called a chapon so that I would be culturally appropriate. So you can imagine, I came home sweaty and ready for a shower. But it is my choice. I choose to live here. I choose to dress according to the standards of the country where I live. Actually most of the time, it is really no big deal. It is a loss of freedom but it is one I choose to give up. When people think of this area of the world, they often think of the loss of freedom for women. They are right. Women here have less freedom. They are considered lesser. Many live most of their lives behind the walls of a compound. Some are required to wear burqas and all will be fully covered. Some are lucky and go to school. Others have no clue how to read and write. They struggle and life is hard. But just as it is for us, the greatest loss of freedom is not the clothes they wear, the lack of education, or the walls they live behind. The greatest loss of freedom is in the mind and the soul. Many don't know that they can be free. They have been told lies that they are not good enough or women can't do that. All their lives they have lived in a country where religion is rules to follow. Their goal is for their good deeds to outweigh their bad deeds. They are oppressed and they need Jesus and the freedom He can bring. 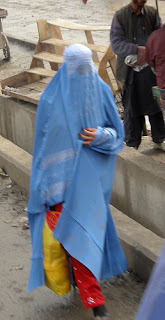 They don't realise they can be free on the inside even if they have to wear a burqa or have less opportunities. Having Jesus might not solve their problems of an abusive husband or no money or having to wear a burqa. But in their circumstances, Jesus will give them peace. He will give them hope. He will make them whole. When local ladies talk with me, they think my freedom is in my passport. I can come and go in most any country. To them, I am considered rich and have lots of opportunities. I have choices. I can choose how to worship. I can choose what I want to be. I am thankful for all these freedoms and I never want to take them for granted. But you know those things are not what makes me fully free. It is Jesus in me that makes me free. I am free to trust and not be afraid. I am free from sin and the guilt that comes with it. I am free to hope in the life ever after. The challenge for me is how to share this freedom with those around me. How do I get past my westernness? It takes time. It takes knowing the culture and the language. It takes dressing appropriately for the culture and respecting their customs. We have been here 4 years and I feel like we are just beginning. I have no grand stories. At times, I can feel discouraged. I am still planting seeds and praying God will allow them to grow into something more. It is a big step for them. Freedom for them will come at a cost that many are not willing to take. Amen, and amen. Thank you Teresa for sharing your wisdom and your heart! Blessed by you . . . So often I focus on the physical, social, or emotional needs of people I meet. Thanks for the reminder to focus on the only need that matters--Christ Himself!